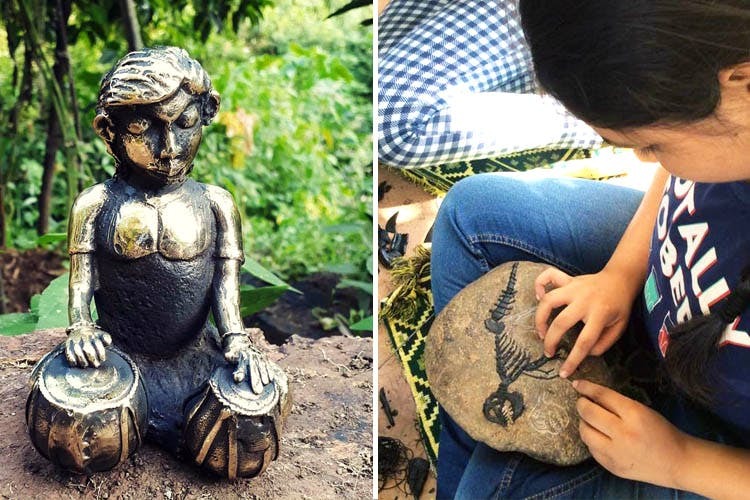 Situated in the hilly terrains of Panchgani, the art village of Devrai, spreading across two-acres of land is home to highly skilled Adivasi craftsmen and artists from the naxalite affected areas of Gadchiroli & Chattisgarh. Devrai Art Village is not more than two-and-a-half hours away from Pune, via NH48. If you want to take the local transport, there are buses and trains that ply regularly from Pune to Panchgani. A day visit to Devrai is a joyous experience in itself! The place is literally the melting pot of tribal culture. The local artists collaborate among themselves to create beautiful artifacts, brass paintings, statues, rock dhokra and more. These exclusive knick-knacks are made and available in iron, brass, stone, wood, bamboo and fabric. A brainchild of Mandakini Mathur, the products at Devrai strike a beautiful balance between the rural and the urban worlds. It’s fresh, and has a story to tell. Artforms of pot dhokra and tumba craft are practised by certain groups out here. We loved their collection of brass fittings in shapes of miniature figurines, starting at INR 2,500. Interesting lamps in wood and terracotta, starting at INR 3,000 are another set of eye-catchers. If you’re looking for something unique and artsy for your outfit, you must check out their collection of silver pendants in shapes of flowers, turtles, faces, symbols and fascinating patterns. If you want to explore the place and stay for couple of nights, we suggest you check-in at the Devrai Homestay by Mandakini herself. Perfect for two, the place is equipped with internet and kitchen facilities. Book your stay here. Devrai is the perfect place for people who love art, explore various culture and document these experiences in multiple forms. The locals are quite friendly and will welcome you to their quaint huts and work spaces. Sit with them, chat and make a cute little something for yourself.